The U.S. Food and Drug Administration has approved the DEKA Arm System for amputees. Named in honor of Luke Skywalker, it's the first prosthetic arm that can carry out simultaneous multiple movements triggered by a person's electrical signals. The device was developed by New Hampshire-based DEKA Research and Development Corp, which was founded by Dean Kamen, inventor of the Segway and other devices. 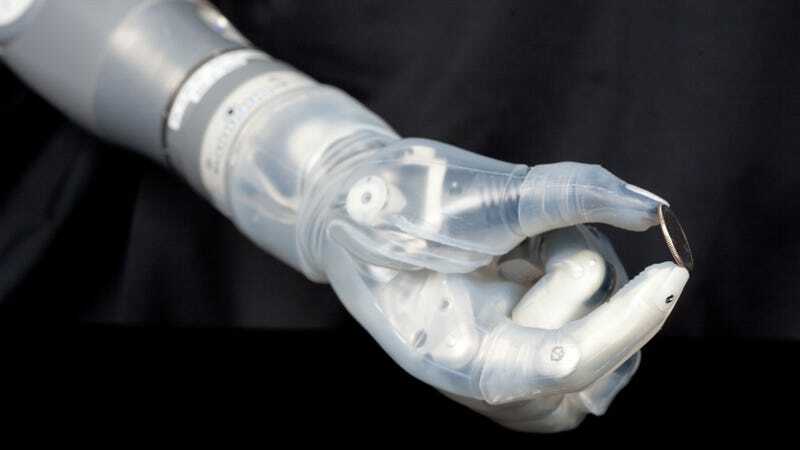 DARPA also had a hand in this, providing more than $40 million in funding as part of a larger $100 million project to improve prosthetics. The device has been in development for the past eight years. "It was designed to produce near-natural upper extremity control to injured people who have suffered amputations," noted program manager Justin Sanchez in a Reuter's article. "This arm system has the same size, weight, shape and grip strength as an adult's arm would be able to produce." Movements are controlled by signals from electromyogram electrodes that detect electrical activity caused as a person contracts muscles. Wireless signals are generated by innovative sensors on the user's feet, among other input devices. Electrodes transmit signals to a computer processor embedded in the arm, which can then execute up to 10 specific movements using a combination of switches and sensors. "The DEKA Arm System may allow some people to perform more complex tasks than they can with current prostheses in a way that more closely resembles the natural motion of the arm," Christy Foreman, director of the Office of Device Evaluation at the FDA's Center for Devices and Radiological Health, said in a statement. The Pentagon's involvement came about because of the type of injuries sustained by U.S. troops in the Iraq and Afghanistan wars. The Pentagon said more than 1,800 U.S. service members underwent major limb amputations as a result of injuries sustained in those wars. "This prosthetic limb system can pick up objects as delicate as a grape, as well be able to handle very rugged tools like a hand drill," Sanchez said. Until now, the best technology available to troops and other who lost an arm was a metal hook, Sanchez said. "The metal hook was the most commonly used prosthetic device for the last hundred years." DEKA said on its website that the arm is dubbed "Luke" after Luke Skywalker, the character whose hand is sliced off in a duel and is replaced with a robotic version in the 1980 film "The Empire Strikes Back."